Si-o-se Pol Bridge is a stone double-deck arch bridge in Isfahan, Iran. It is also called Siose Bridge (which in Persian means “33 Bridge” or “Bridge of 33 Arches”) or Allah-Verdi Khan Bridge. Si-o-se Pol Bridge is built by the chancellor Allahverdi Khan Undiladze on commission from from Shah Abbas whose chancelor he was. Si-o-Se-Pol, also known as Allahverdi Khan Bridge, is one of the eleven Isfahan bridges, crossing Zayandehrud River. It is the most famous bridge of Isfahan due to its size, central location, and prominent architecture. 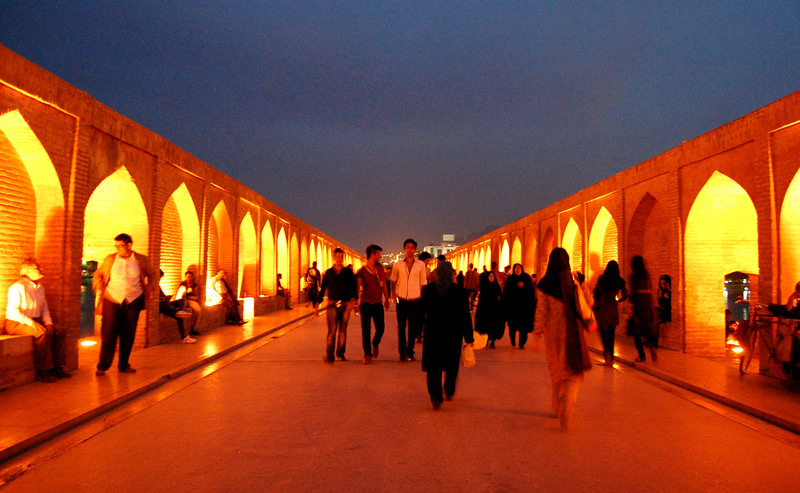 The bridge is a center of city nightlife that attracts both Iranians and foreign tourists. It was constructed by the inspection and the financial support of Allahverdi Khan Undiladze chancellor of Shah Abbas I, an Iranian ethnic Georgian. It consists of two rows of 33 arches from either sides, left and right. Bridge has a large plane at the beginning of the bridge where Zayandeh River flows faster. There it has more arches making with that a suitable place for a tea house that can be accessed from the southern bank. There are two levels of arches. Lower level has 33 arches while upper has two arches above lower lever arch and one arch above pier. Road that goes on the upper level is bounded by two high walls that protect travelers from winds and pedestrians that can walk there, from falling. Every year, during Norouz (the traditional Iranian new year holiday) the bridge is decorated with lights and flowers. The lights on the bridge give it a stunning view as every single arch has its own flashes of light to make the site a shining spot which attracts many more visitors at night than during daylight. This structure consists of two rows of 33 arches from either side, originally decorated with artistic tiles and paintings. The bridge has a sidewalk on the top and another one with a ceiling near the water level. 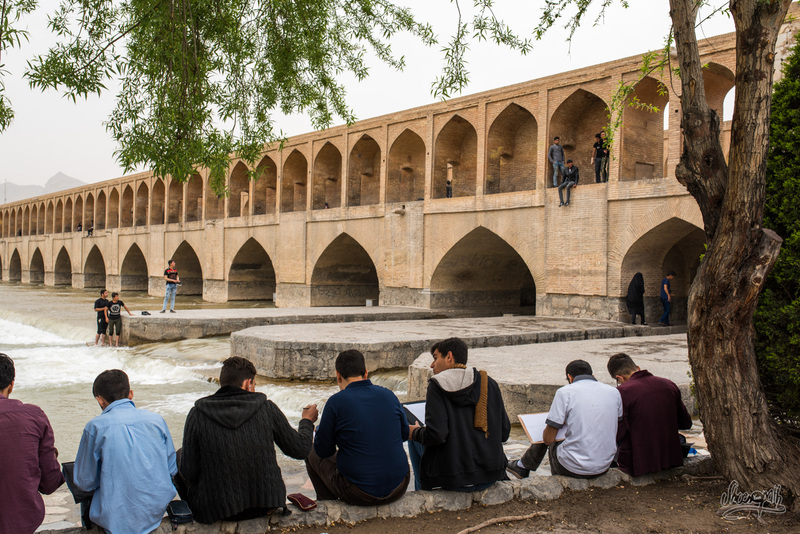 The bridge’s double-decker structure is built of yellow brick and limestone, the typical materials used in Isfahan architecture. The lower level rests on piers, separated by 33 arch sluices where the river can flow past. 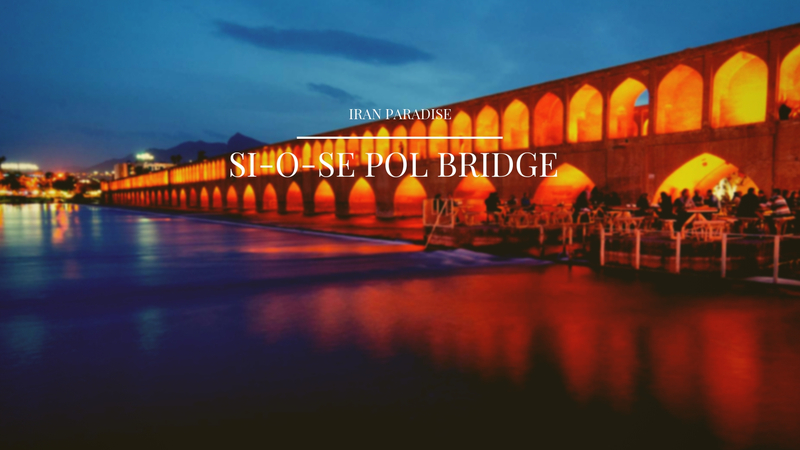 These sluices give the bridge its name, “Siosepol “, which means “the bridge of 33 arches” in Persian. The upper deck in the middle of the bridge is predominantly designed to be used by government leaders. Si-o-Se Pol connects Chahar Bagh-e Abbasi and Chahar Bagh-e Bala streets, being, in fact, their extension. It is located in the city center, within walking distance to main city attractions. If you walk to the north along Chahar Bagh-e Abbasi street, in 20 minutes you will reach Naqsh-e Jahan Square, Hasht Behesht Palace, and Chehel Sotoun Palace. On the southeast from the bridge, there is Vank Cathedral and Isfahan music museum. 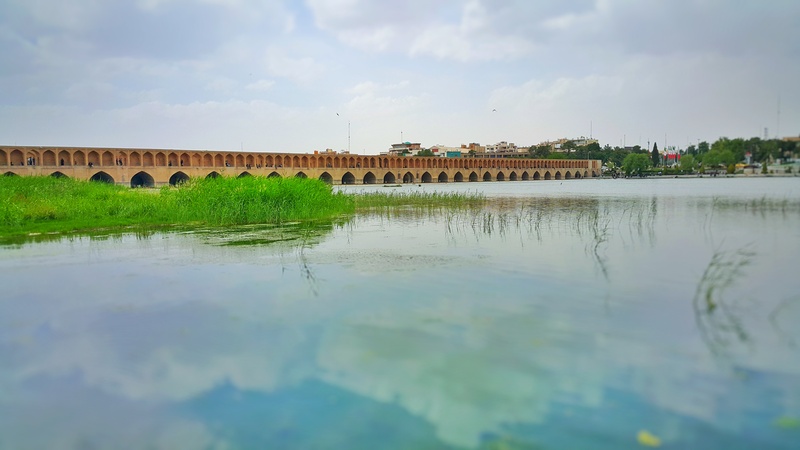 You also can see other bridges over Zayandehrud River – such as Joui and Khaju bridges. There is Si-o-Se Pol metro station near the north end of the bridge and several bus stops, shopping centers, cafes, and hotels. Served a primary function as a building and a place for public meetings, this bridge contains a tea-house on the lower deck with tables and chairs set up along a narrow passage under the southern end and also on the outside ledge near the shore. Between the tables, flights of stone steps lead to private chambers, where families or groups of friends can enjoy their tea with enough privacy. Located in the center of the city, Siosepol is one of the most crowded and popular places in Isfahan, especially in the evening. It is worth mentioning that going over the bridge by car is impossible, but you can ride a bicycle there when it is not very crowded.